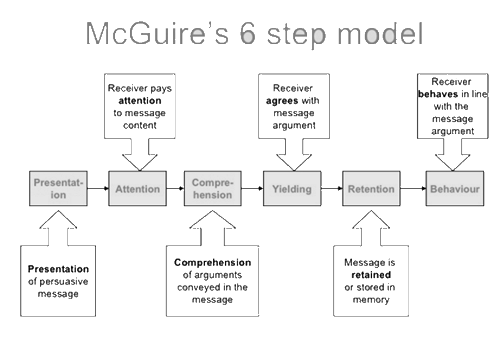 Social psychologist William J. McGuire proposed a six step model of persuasion that can be adapted to structure a coaching conversation. In the coaching process, presenting the goal will set the direction of the session. The goals will be processed via auditory and visual channels. The coachee could start bringing from his memory successful or less successful outcomes from the past. If the coachee’s comprehension of the goal is based on past success, he could become overconfident and may not want coaching. If the comprehension is based on past less successful outcomes, then he may procrastinate or find excuses to not engage in the coaching relationship or work towards the goal. The coachee could yield to his past experience. This yielding to past experience could be stored in short-term memory and transferred to long-term memory. The coachee’s behavioral outcomes are based on the above process. What can the coach do to manage this event? Situation modification and attention deployment by the coachee can be done through reappraisal by using the model developed by The Amsterdam school of Creative Leadership given below. 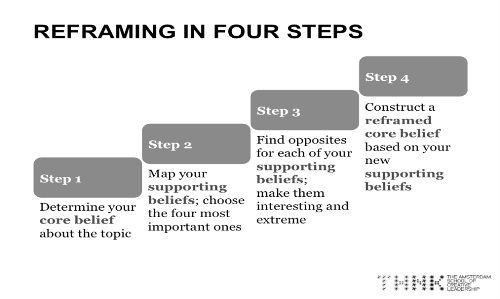 As you can see in the model below, reframing begins with one’s beliefs. This is followed by choosing four important beliefs that support the core beliefs. After this stage we reverse a bit by bringing the opposite for each of the support beliefs. Once this is done we are able to make the coachee reframe his belief system and move forward. When this is done, the coach will work fundamentally with the core belief of the coachee. We help coachee ignite his potential. R.R. Krishna has about 30 years of work experience in Human Resources spanning different industries. He is a PCC, – ICF, RPCC – RCS, CMC – BCI/ICC and a CPC from Fowler International Academy and Executive Masters in Neuro Leadership with 15 years of coaching experience and also member of International Association of Coaching, Asia Pacific alliance of coaches and Association of Coaching. Find more about Krishna, visit www.rrkrishna.com and www.potentialgenesis.com. Await his first book Prismatic Coaching- Getting to the heart of the matter though self-directed coaching.